In this performance, As’tele Hangout 2.0 brings out more of Africa as the artistes would promise the audience of fresh experiences. Putting the performances together at Shodex Gardens in Lagos on Nov. 18, 2018, Tantoloun Productions presented a selection of creative works in dance, music, poetry and visual arts to meet more of what the audience yearned. The crew of Tosin Oyebisi and the creative pact was convinced that the performances were lending strong voices to tell daily stories and experiences in Africa, and better told by Africans in expressions loved by all. Done in partnership with Nature’s Protection and Environmental Improvement Initiative (NAPEIIN) and Shodex Green theatre, As'tele Hangout took the audience on several journeys, engaging the audience from point to point- yes, they had room to make comments and suggestions engineering the storytellers’ wheels. This edition featured 3 musical pieces by Tantoloun Productions: Ekombi medley, ko gbagidi and an adaptation of Beethoven’s fur Elise. 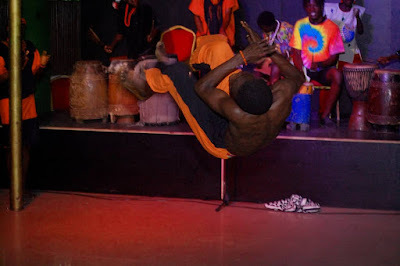 Pelumi Baba performed Rap/Yoruba poetry; Footprints of David performed a Nigerian Heritage Dance piece tttled "Together we fly" Choreographed by Seun Awobajo; Tantoloun Productions performed a dance piece about discovering, exploring and engaging the beauty and splendor of existence . Jojo bodybeats (Joseph Omotoye) the bodiophonist, who made music with his body, got an award recognition for contributing beautifully to the art. 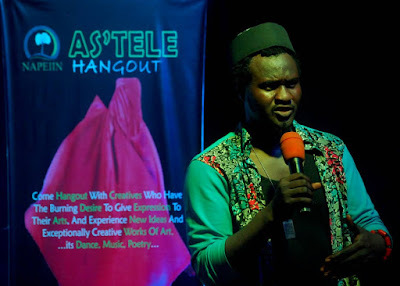 The As’tele Hangout creative team include Esther Essien, Esther Chinenye Umeonwujiobi, Bakare Abiodun Ismail and Oyebisi Tosin Akinboye. The music team had Adisa Abiodun Timothy, Temitope Fash (sax parrot), Fabiyi Abiodun Samuel (Abbeyjazz), Awoko Habeeb Ayodeji, Goodluck Babatunde, Charles Ekpenyong, Kelvin Ekpenyong, Esther Essien, Oluwatosin Oyee and Bakare Abiodun Ismail.